Obviously someone else decided which photo was better my dear Luca and I do congratulation you from the bottom of my heart on double award for this one ... more than deserved !!! This should have been given an award by now. Seriously. Che prospettiva, che geometria, che toni. Captivating perspective. very nice BW tones. Ciao, Gy. But you have images and that's much better, Luca! Except the grandious perspective, moment and exposure balance there is also something Escher-like on this one, that brings impact onto incredible levels, Luca! It is very real indeed, and every small detail is just as if I could touch it, but at the same time there is some touch of "possible impossibility" here! And even the general transition from highlights to shadows from the top to the bottom seems to enhance the look and feel. Really, and incredibly well thought out and shot image. If I also add the somewhat "aged" look, then this represents one of the best shots I ever saw, not only of a special place but also (and above all) for its tremendous power. I wonder why this one didn't receive any award yet! grazie molto per raccontare di me, il mio caro amico! that for these photograph is better the province of Rome Almost all of the country around Rome have same closes. wow, this is a gem of a shot really...superb. I am planning to visit Europe soon.. and I MUST go to Italy.. 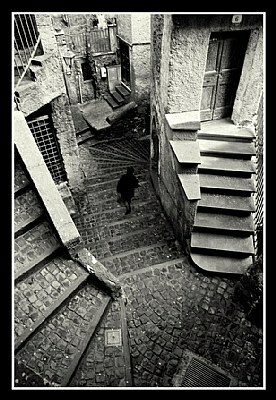 I have plans of seeig Rome.. but, frankly, THIS is the kind of photography I want to do !!!.. can I get this in Rome ???? Or do I have to go to some other places ? tell me, my friend... tell me.. WOOOOOW!! Luca !! What an unusual architecture !! really attractive. Luca, just change the project to Henri. This is a front page candidate.. and I'll see to it ! Bellissima e ben composta con un'eccellente inclusione della signora che solitaria se ne torna a casa. What a excellent composition and amazing color tone my friend . I know it is the same place Luca ... just wanted you to know both shots are stunning and I just can not chose which one is better !!! Keep up the good work and you are so good !!! Can not chose which one is better ... this one or Staircases Luca ... anyway, stunning, bravoooo !!! Wonderful picture Luca..very nice tones and contrast. congrats! !